How Much do we pay for Gold? 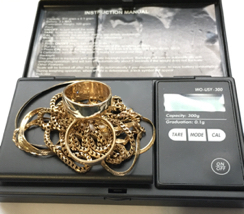 Each item is different, so I will determine weight and quality of the gold when I receive it and pay you 70%- 80% of the going rate of the market for the day it is received. Before we can use your Gold we send it to the Smelter and have the impurities and alloys removed and then made into clean 14k or 18k sheet ( etc ) ,so we can use it to make new products. 80% is the price paid when we re-condition your gold. About 7-10% is lost with impurities and residue left behind. That leaves about 10% for the work for smelting , rolling it back into a working form for your item and a profit. First, I would suggest you go through your old gold and find items that have the content stamped on the inside or back. Next, For your Files…Put each karat type into separate bags, ( a 10k bag..a 14k bag )… and record it’s weight. The Post Office has scales that measure in grams. This is for your own record so there is no questions as to how much you are sending. I will verify this when the package is received. – Please do not put ‘ Bearclaw’ or ‘Jewelry’ on the outside of the package . Ship Registered and Express if you wish. Q: I don’t know if the gold I have is real gold. A: Everything sold in North America and Europe will have a stamp on it signifying the gold content….it would be a 10k, or 14k etc…stamp, usually on the inside or back side of the item. A ‘GF’ stamp means it is gold filled. Q: What content is my gold Nugget? A: Nuggets are usually from 18k to 22k on average. Nuggets have impurities and it is rare to fine a nugget that is ‘ pure ‘gold . I challenge you to ask them to disclose the amount they pay out....then come back here for your proper value.